Medibank is Australia’s largest private health insurer with 3.8 million members, 29.1% of the market, under the two brands of Medibank and ahm. As the Head of Testing for both brands, Rizwan Javed engaged Planit to deliver upon two of his strategic priorities. The first of these strategic priorities is providing genuine customer-centred healthcare that connects people with the health experience they need, through whatever channel they choose. The second is operational excellence, always looking for simpler, better ways of doing things for members, providers, and employees. “To achieve our strategic priorities, we require the industry’s best testing partner. We choose to partner with Planit for several reasons. “First, I have absolute confidence in the quality of Planit’s resources. With other vendors it’s “hit and miss”, but with Planit I know I will get the best people who are well trained, ISTQB certified, and who are kept up to date with ongoing training. This means we receive proactive, trained and dedicated consultants, who are also skilled in testing, to achieve quality outcomes. “Secondly, Planit’s responsiveness is outstanding. Where other vendors have to go to market to get people, Planit employs its own internal team and I can rely on them to provide the best fit very quickly, making it easy to ramp up and down as I need to. This increases our responsiveness throughout the project and effectively accelerates delivery. “Thirdly, Planit’s value for money is very high compared to the market. The costs savings we achieved as a direct result of Planit’s skilled and talented people is absolutely significant to our return on investment. 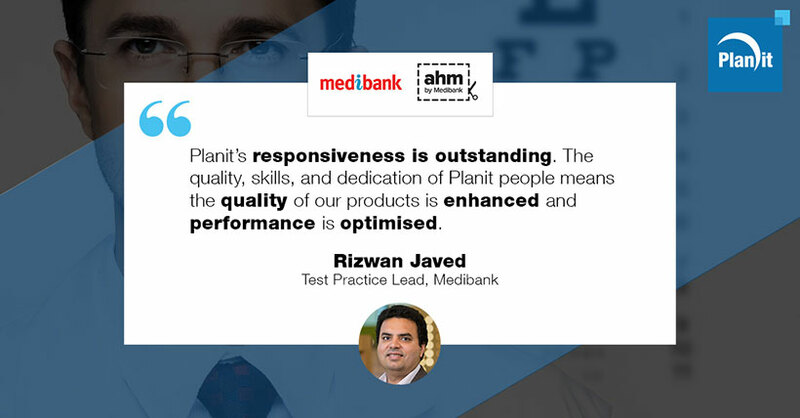 For example, Planit’s test managers and leads consistently contribute to raising the visibility of risks associated with projects, so Medibank is well positioned to make well informed decisions. “From the testing perspective, providing customer-centred healthcare is about improving our customers’ experience. The quality, skills, and dedication of Planit people, testing new products and applications to ensure our customers’ experience is positive, means the quality of our products is enhanced and performance is optimised.